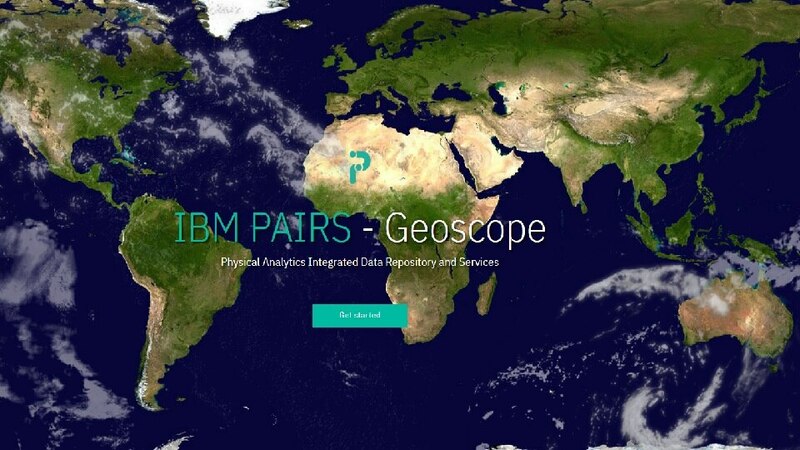 IBM PAIRS GEOSCOPE is a platform, specifically designed for massive geospatial-temporal data (maps, satellite, weather, drone, IoT), query and analytics services. It frees up data scientists, developers from the cumbersome processes that dominate conventional data preparation and provides search-friendly access to a rich, diverse, and growing catalog of continually updated geospatial-temporal information. Example: Give me all weather data and the elevation for all airports in the Southeast Asia? Example: Show all areas in Iowa which has in the month of June an normalized difference vegetation index (NDVI) larger than 0.8 and less than 20mm of total precipitation? Example: Calculate irrigation forecasts for all vineyards in California?